Death is what they said is “Inevitable”, the untimely death of this Ivorian Defensive Midfielder, Cheick Tioteis is a catastrophic bombshell. 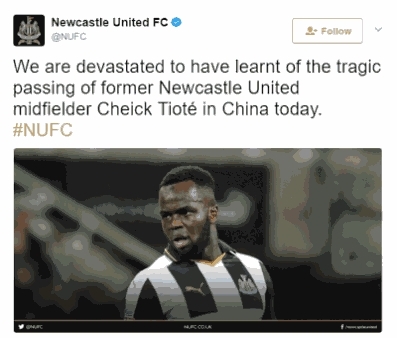 Cheick Tiote who is a former footballer playing for Newcastle died yesterday, Monday, June 5, 2017. According to reports, Cheick Toite died after he collapsed which he was training with his team in Beijing, China. Cheick Tiote who is an average man of 30 years of age started his career as a professional football player in Belgium side Anderlecht, after some time, he moved to a Netherlands club, FC Twentein, before joining the Newcastle in 2010. He later moved to Chinese club in Beijing Enterprises this year February. His fans most especially on Twitter, has show sympathies and condolences to this veteran footballer who lost his life untimely. May He Rest in Peace (Amen).